Provide comfort for the family of Judy Wilson with a meaningful gesture of sympathy. 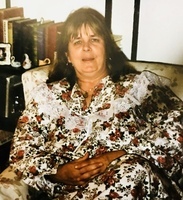 Florence “Judy” Wilson-Graham who lived a life full of love and laughter, passed away in Owen Sound while surrounded by close family on March 21, 2019. In her life and until the very end, Judy was a fighter who never surrendered! Just like the way she lived without reserve, she is now reunited with the love of her life Dave, who she was married to for 32 years until he passed in 2012. Judy and Dave married in 1980 and they spent 10 years together raising their girls in between working in Vancouver and Edmonton, before returning back to West Grey where Dave’s family was from in Williamsford. First, they lived in Holstein for a few years, before settling in Ayton where Judy lived up until her passing. She was a dedicated and loving mother to her kids Charmaine, Steven, Lynne and Matthew, and especially loved being “Nanny” to her 4 grandsons - Jade, Cody, Alexio and Troy. Friends always knew her as Judy. The one person who was there for them in both happy times and the tough moments in life. Whether she could cook or bake to offer comfort to friends, Judy was always there to lend a helping hand to anyone who needed one. She loved the beautiful summers at her home in Ayton but anyone who knew Judy would always find her home if there was any snow on the ground! She was always independent and even drove across Canada flying solo at the young age of 68, making it the 15th time she had driven across the country. All who loved her will never forget her tenacity, honesty (whether you liked it or not) wit and a little sassy humour. She was one tough woman who managed some of the biggest bars in Vancouver during the ’70s, loved her Harley and was known for her tough attitude and mud wrestling titles from Kitchener Waterloo! Judy was such an inspiration to her family and friends, as she faced and conquered an impossible battle to win, she did so with the most empowering attitude and loving nature. To send flowers in memory of Judy Florence Noreen Wilson, please visit our Heartfelt Sympathies Store. Donations are being accepted for: RESIDENTIAL HOSPICE OF GREY-BRUCE INC. (Residential Hospice of Grey-Bruce Inc.).